Brands are finding it increasingly tougher to reach out to their consumers on social networks, with the growing number of social feeds one has to keep up with in these times. Yet, the only way out for them is to keep going with the content strategy designed specifically for their various social media properties. The result is a weekly brainstorming session, armed with a team of brand strategists, artists and copywriters, who together try to weave an engaging consumer connect communication, day after day. Be it for the regular days of the week or weekend specials along with occasions like Friendship Day, Diwali, or Mother’s Day, brands are always ready with their witty, creative or emotion-laden visuals/gifs/videos. In fact, a few never miss out even on National Burger Day or International Sushi Eating Day! But, its 2015 and nearly every brand has invested in amazing content for their social media properties. The challenge is to stand out in this clutter, to be ‘real quick’ in sensing what’s buzzy and what can spread organically. Remember “Power Out? No Problem…you can still dunk in the dark,” Oreo’s super viral tweet during Super Bowl 2013 power outage? The creative team had waited all evening to create this big moment! Back home, we had many brands that impressed us with their timely content, raking in likes, retweets and shares in the process. When Google rolled out its brand new logo this September, little did we realize that this was an excellent opportunity for an art and stationery brand to bring alive its core proposition of “Let’s Have Fun”. A Google Doodle depicted a hand rubbing off the old logo and writing the new Google logo with colourful crayons. #GoogleLogo became the trending topic on major social networks; everyone was amused at how a tech giant like Google can get so ‘childish’ with its brand identity. In came Kokuyo Camlin, the popular crayons brand we all grew up with. It quickly created a fun video as a tribute to Google’s new and colourful logo, and became an instant favourite of fans. Read full story: How Kokuyo Camlin Nailed Real Time Marketing With Its Video Tribute To Google’s New Logo. Flipkart is another example of clever content strategy. The ecommerce brand which otherwise focuses on maximizing its app downloads and its many product offers, also resorts to timely content to connect better with its target audience, at times. When Ninetendo founder, Satoru Iwata passed away, Flipkart paid a fitting tribute to the founder. The iconic first image of Pluto was the talk of our planet, when it was captured by NASA’s Pluto mission. And the fun part – there is a heart-shaped formation on the planet. Brands in the business of love could have capitalized on this, but it was Cornetto India that took the crown that day. The icecream maker shared a sweet little love story from ‘Terribly Tiny Tales’ that weaved in the heart seen on Pluto! It was run as a Promoted Tweet that has earned over 500 retweets and 1000 favourites. Understandably, Disney’s most loved cartoon character couldn’t be left behind. Disney India rolled out a video about a Pluto sighting that’s simply out of this world. Zomato, the restaurant search app which is on a global expansion spree, and which really produces some amazing content for its food loving community, did not share a visual treat as always. However, it did convey NASA’s New Horizons spacecraft of its inter-planetary expansion plans. Hey @NASANewHorizons, let us know if you find any restaurants during the #PlutoFlyby. We’ll include Pluto in our expansion plans. When Earth 2.0 – a planet similar to Earth was discovered, a couple of brands got really carried away, calling it as Big Brother and Lost cousin. Housing.com, the startup with the most aggressive brand marketing campaign and fast growth track, came up with an interesting visual for our long ‘lost cousin’. Idea Cellular asked its fans if they were ready to move to Big Brother Earth 2.0. What we can see is that a dedicated and opportunistic creative team, a fast approval process in place and a brand’s strong intention to create that big moment on social media can surely lead to some magic. As the world is engaging with one another in real-time, its timely content that brings about memorable conversations, without the brand spending on paid media. These are a few of the coolest examples that I could find this year, but I’m sure there are more. 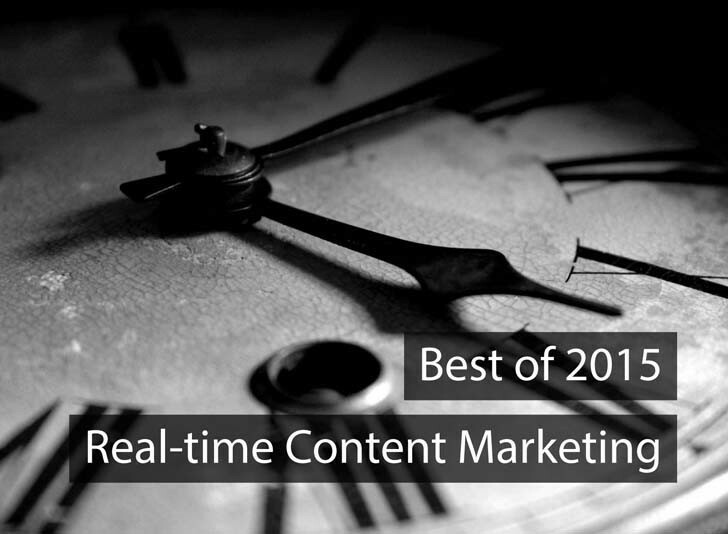 Do share if you know of any other witty visuals/gifs/videos that deserve a mention as best in real-time content marketing of 2015.